So here’s the big announcement, well actually two. Number 1: I am moving. Not literally, but the blog. I’ve taken the plunge, bought some Internet real estate and a hosting service, and I’ve been pulling my hair out trying to make the whole thing look good. But why? You may ask. First, I’m still working to figure out exactly what my blogging career is going to focus on, and my new address gives me more flexibility. Second, it allows me to create an online portfolio under the same umbrella so I can work on building mad skills. Finally, while I adore the ten or so of you out there that actually read this blog, now is a good time to move if I want to try to grow a bigger audience. If I wait it’ll just be more painful. So here I go. Number 2: I have a new job! My new post is at a design and consulting firm working with clients who need to train their employees on just about anything. I’ll be doing all the creative work plus a lot of client-relationship management. Thanks Heather and Kristin for giving me a great head start. Once my first project goes up, I’ll be sure to share, since it’s all about me. 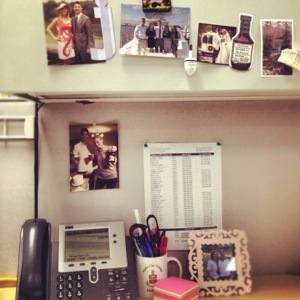 Check out a slice of my new desk! Yes, that is a Sticky Fingers magnet. I’m sure you can all guess the reasons why I’m excited, and if you want to know more, feel free to send me a note. This entry was posted in Life Etc. and tagged big news, jkhnelson.com, moving blogs, new job, self-hosting by Jen Nelson (jkhnelson.com). Bookmark the permalink.